It's almost Valentine's Day, and I have got a brand new love. Well two, actually. They are tall and gorgeous, and they're both hanging in my dining room right at this very moment. Did you see them? 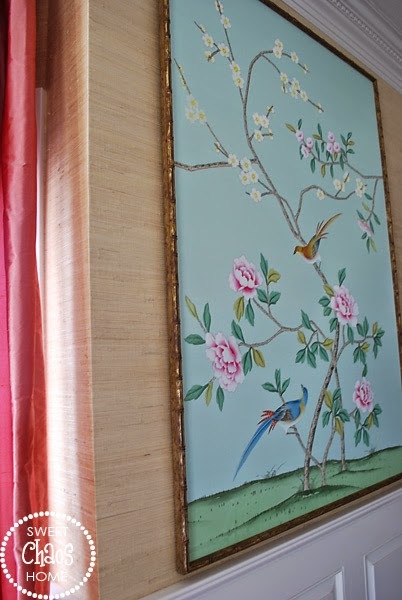 My chinoiserie wallpaper panels. They complete me. An entire room in this exquisite paper is out of my league. But, a couple of panels, framed as art, would give me the look for less and fill my empty dining room walls. I did some research and discovered Griffin & Wong. 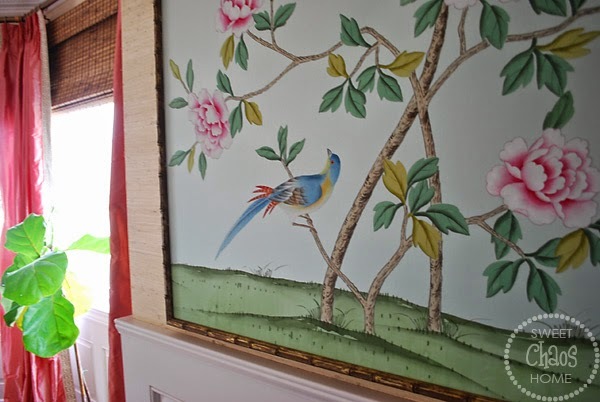 They offer 25 chinoiserie designs, hand painted on a variety of silk wallpaper backgrounds. Douglas at Griffin & Wong worked with me to find just the right match. I chose two of their Du Paqier panels in a soft aqua background. I was emailed a picture of the paintings in progress to determine if I wanted more color intensity. The panels typically run from floor to ceiling, but they made mine to accommodate the space above my wainscoting. When the panels arrived at my door, I was a bit nervous. What if the picture online didn't look the same in person? I was pleasantly surprised to see they were even more beautiful and vibrant in person! The panels came rolled up, so I had to figure out how best to hang them. I went to Lowe's and had some hardboard cut to size. I then had my wallpaper installer apply the paper to the boards. I had thought I could DIY that part, but I didn't trust myself to not mess it up! Once the paper was mounted to the boards and dried, I had them framed in an antique gold bamboo frame. I didn't use glass for two reasons. One, I wanted to save money. And two, I was hanging the boards on top of grass cloth wallpaper. I didn't want to hang anything too heavy that would require more than one small nail hole. I really love how the new art fills up the dining room walls and completes the look of the space. I find myself spending more time in there, just so I can admire them. Gorgeous! And what a fantastic idea! My goodness, that's beautiful. I love your house! Carolyn, Your panels are perfect .. no wonder you're thrilled:) Aerin Lauder's dressing room is stunning. I'd love a little of that in my closet! it's a great idea...love the colors! My wallpaper installer arrives at 7 this morning and I should be sleeping but I'm always like this when paper is going up. This was such a wonderfully charming idea! I think "no glass" was a wise decision too. That much glass would have made the panels very heavy!! Ahh yes… I totally understand! It's exciting and scary at the same time :) Good luck! I'd love to see how it turns out. Fantastic dining room! Those panels just make it. I love your style! You are so sweet! Thank you, Brenna!! Those are gorgeous! I love how you framed them out! I am OBSESSED with Gold faux bamboo! Wow, Carolyn those are stunning!! I missed this post. I love the bamboo frame, too. Just perfect. 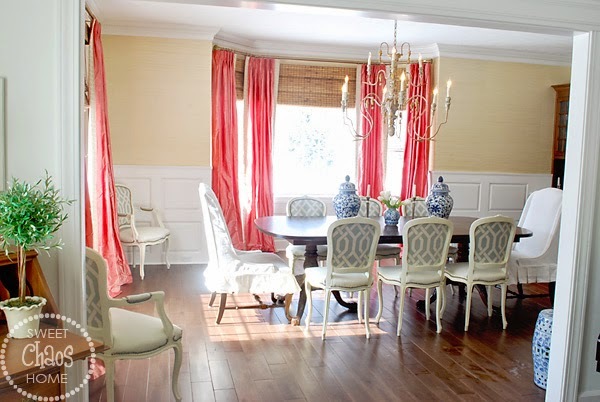 Carolyn, They are beautiful and perfect for your dining room! Thank you for joining the Share Your Style party and sharing your pretty panels. Carolyn these look stunning and I love the bamboo frame!! Your home is so beautiful!! Simply stunning - really - just stunning ! That was so sweet of you! Thank you!! I love them, they are gorgeous and it was a great idea, I would also be in love with them too! Your house is beautiful and this is perfect for it. Thanks, Fabby! Hope you had a wonderful Easter! 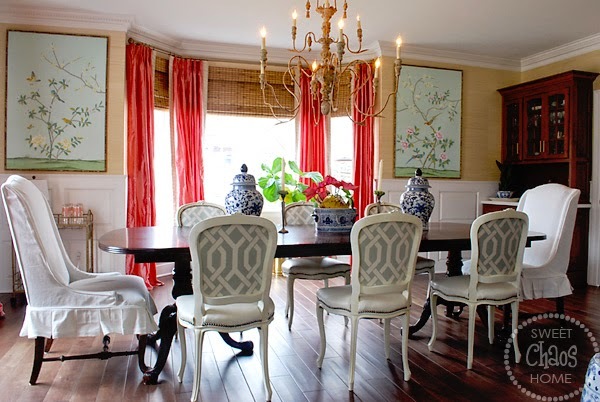 Love the chinoiserie wallpaper panels, and the drapes in your dining room are such a pretty color.They compliment each other beautifully! 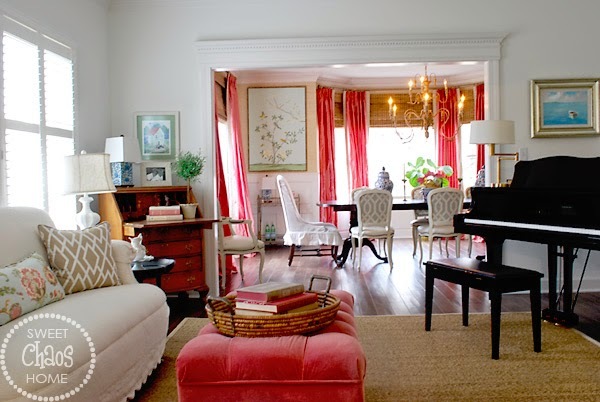 A Gorgeous room! What a stunning and creative idea!! May I ask if you got one panel that you cut into two? Or did you order two separate panels and have them modified to fit in your space? If you chose the second option were they each less expensive because they weren't 10ft tall? Thank you for the beautiful inspiration. I found your blog thru TDC and will be a regular follower from now on! Thanks for your question! I ordered two panels and had them modified to fit the space. Douglas at Griffin & Wong was great to work with. I'm sure he'd be happy to talk to you about different options if you're interested in doing something similar. You can also email me at sweetchaoshome@gmail.com. So glad you found my blog, and I'm happy to have you follow along. Thanks so much!! Digital Wallcoverings is one of the best ways to freshen up a room by adding a shot of colour, texture or pattern. There are countless options depending on personal taste and the look you are trying to achieve: block colour wallpaper, striped wallpaper, glitter wallpaper, brick wallpaper and butterfly wallpaper to name just a few. 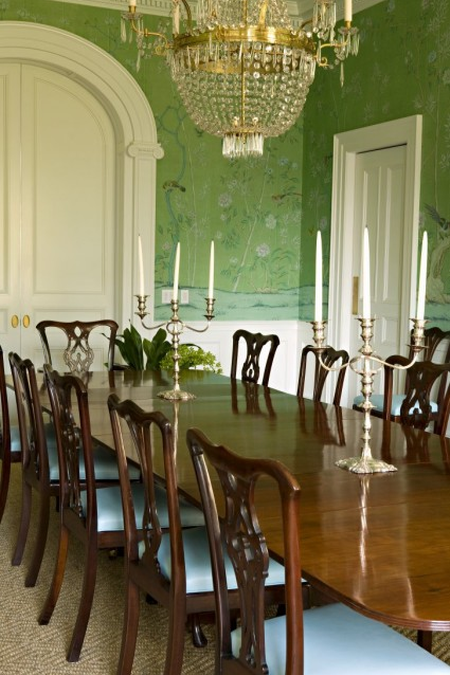 You can also use wallpaper to bring a more sculptured artistic element to the room in the form of wall murals or plain walls accented with wallpaper borders. Dear Carolyn, Thank you for sharing this beautiful project! 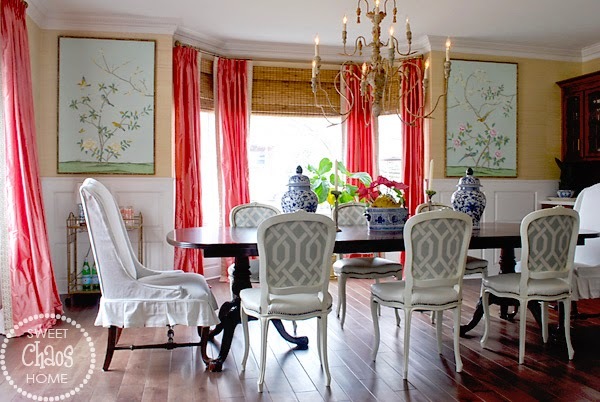 I love your dining room and how beautifully your Chinoiserie panels turned out! May I ask where you found the bamboo framing? I'd love to try this because of your inspiration, but don't know where to find bamboo framing like yours. I live in Orange County CA. I am subscribing to your blog today! Thank you so much!